Find the software that will help you do what you do better. Join the millions of people who use Capterra every month. To start your search today, visit Capterra.com/twist. An award-winning platform to invest in solar energy projects across the U.S. Earn up to 8.5% annually while diversifying your portfolio, curbing pollution and combatting global climate change. Create your free account at wundercapital.com/twist. 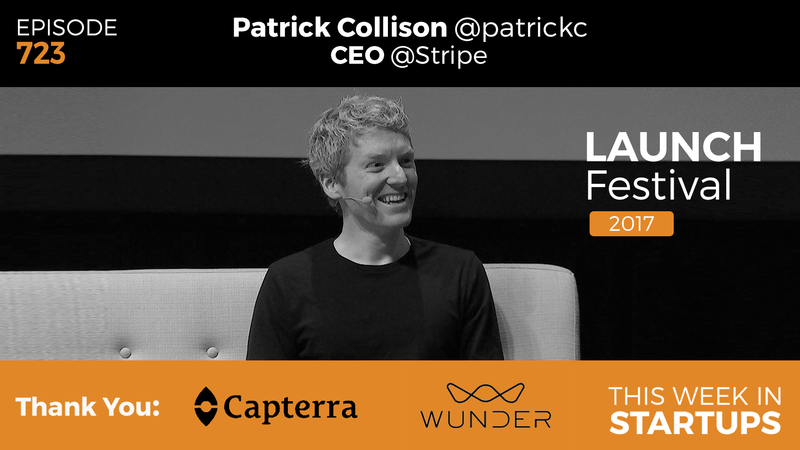 Filmed at LAUNCH Festival 2017, Jason sits down with Stripe CEO Patrick Collison to explore his journey to solving one of the toughest barriers to a global e-commerce economy: payments. About a decade ago, companies were mostly working with legacy players like banks, gateways and processors, and they were essentially looking to buy a technology service from them. These financial institutions were huge, but focused on particular markets, which provided an opportunity for Stripe. Today, Stripe works with companies in 124 countries and handles billions of dollars of aggregate revenue every year. Join us as Patrick shares an inspiring story of his early days at Y Combinator, mistakes and triumphs, opening the Atlas program to US-based startups, and his views on public/private markets.